The Digital Revolution is changing the world: computers and digital devices are making what were previously manual tasks easier, faster, cheaper and more predictable. Even in dentistry, digital technologies are rapidly advancing: intraoral, desktop and face scanners, cone beam computed tomography (CBCT), software for computer-assisted-design/ computer-assisted-manufacturing (CAD/CAM) and fabrication procedures like milling and 3D printing are changing the way we treat our patients. For this reason, the International Digital Dentistry Society (DDS) has been formally established. • to educate dentists, students, technicians, software developers and engineers on the use of digital technologies in dentistry, through congresses, courses and seminars, high level publications and e-learning platforms, and therefore to help them in developing their professional knowledge and ability. • to draw specific guidelines for the use of digital technologies in dentistry, in order to set and maintain high professional standars, which strengthen the power of Digital Dentistry worldwide. • to study and therefore validate the new digital technologies and products offered by the Dental Companies/Industries. • to secure professional recognition for Members and Partner Companies/Industries. • to help affiliated Societies and Organization to promote their activities. 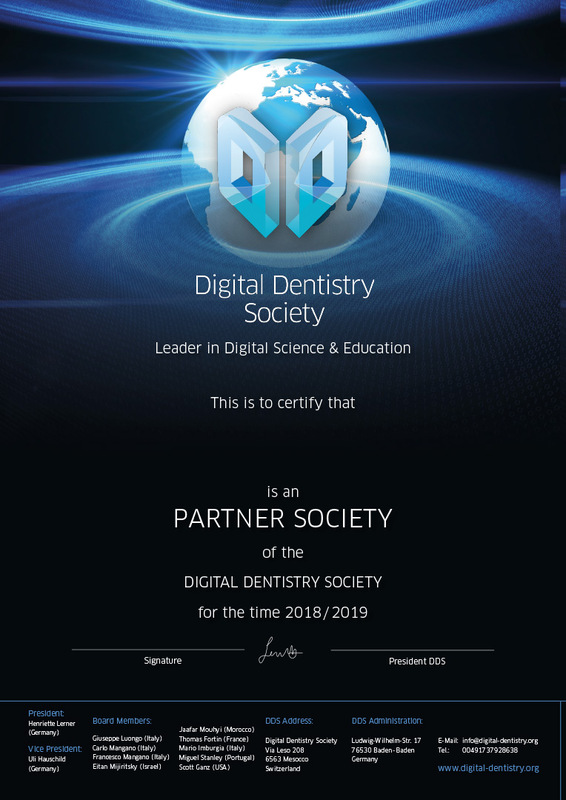 • to connect dentists, students, dental technicians, software developers and engineers, encouraging research, communication and collaboration between them, in order to stimulate opportunities for the advancement, extension and practice of Digital Dentistry worldwide. • to enhance the scientific potential, capability and achievements of Digital Dentistry. • to collaborate with Dental Companies/Industries, in order to promote the role of Digital Dentistry worldwide. • to develop mutual understanding and cooperation among the affiliated Societies of different countries. • to seek interdisciplinary technological cooperation with other international organizations in the public and private sectors.